An actor named Andrew Largeman (played by Zach Braff) returns to his hometown after his mother’s death. His father is his psychiatrist and he has been taking lithium and antidepressants his entire life. 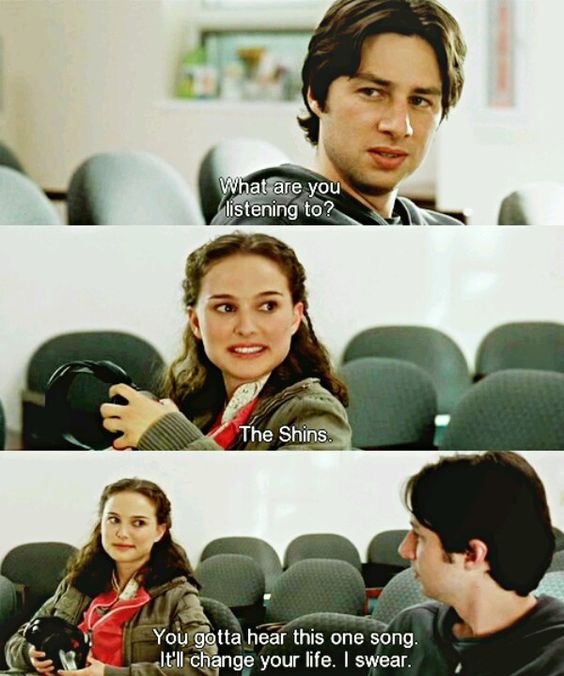 After reconnecting with some old friends he meets a girl called Sam, a pathological liar with epilepsy (played by Natalie Portman) while waiting at the doctors for his appointment. Sam recognises him from a film he was in and then the two of them just click straight away (and thanks to Largeman’s curiosity, I discovered The Shins, one of my favourite bands of all time). This 1980s rival-themed film starring John Cusack and Minnie Driver features the main character, again, visiting their home town, but this time the character is a professional assassin who’s name is Martin Blank. After finding himself feeling depressed, disenchanted and bored with his work he decides to go and visit his hometown Grosse Pointe. Upon arriving there, Martin reconnects with his friend and seeks out his high school sweetheart Debi Newberry, now a Radio DJ, whom Martin had abandoned on prom night to enlist in the army to protect her from his homicidal urges. He then realises that his recent disillusionment with his work and his amends with Debi signify an opportunity to change his life for good. 3. MEMENTO Leornard Shelby (played by Guy Pearce) suffers from Anterograde Amnesia and is trying to track down the man who raped and murdered his wife. Obviously, with the inability to form new memories this is very hard indeed so he makes notes in the form of tattoos on his body and polaroid photographs. The film has a non-linear narrative structure so we’re put into the shoes of the protagonist – we’re as confused as he is and can relate to him and his condition very well. This film is about a couple who have erased each other from their memories. After Joel (Played by Jim Carrey) discovers that Clementine (played by Kate Winslet) had hired New York City firm Lacuna, Inc. to erase all her memories of their relationship, he decides to undergo the procedure himself. This is Tarantino’s second feature film, it is iconic for its eclectic dialogue, ironic mix of humor and violence, nonlinear storyline, and a host of cinematic allusions and pop culture references. It stars John Travolta (who plays Vincent Vega), Samuel L. Jackson (who plays Jules Winnfield) and Uma Thurman (who plays Mia Wallace, Marcellus Walace’s Wife). I was actually going to be named after Mia Wallace! Henry Roth (played by Adam Sandler) meets a young woman named Lucy Whitmore (played by Drew Barrymore) in the Hukilau Cafè and after the two hit it off instantly they agree to meet up for breakfast in the same cafè the next morning. When Henry goes back to the cafè, Lucy shows no recollection of ever meeting him. The restaurant owner explains to Henry that Lucy was in a terrible car accident one year ago that left Lucy, like Leornard Shelby from Memento, with Anterograde Amnesia. As she cannot create any new memories, she wakes up every morning thinking it is her father’s birthday (the day the car crash occurred) and so Henry tries to win her over every single day. This film has so many life lessons in it. Julia Stiles’ character is literally my teen idol and I absolutely love her attitude and the way she presents herself. She’s a character I aspire to be more like! She is so f***ing cool! I should write a separate blog post listing the things I have learnt from Kat Stratford! This film was inspired by a 1997 Backwoods Home Magazine classified ad, itself written as a joke filler by Backwoods employee John Silveira, by a person asking for someone to accompany him in a time-travelling excursion. Darius Britt is a disillusioned college graduate who lives at home with her widower father and interns at Seattle Magazine. One of the magazine’s writers proposes to investigate a newspaper classified ad. Darius discovers that the person behind the ad is Kenneth Calloway and soon poses as a candidate to accompany him on his mission. Darius gains his trust as she participates in a series of training exercises and begins to develop feelings for him. Hunky Dory is set in a Welsh comprehensive school during the long hot summer of 1976 where keen drama teacher Vivienne (Minnie Driver) fights sweltering heat and general teenage apathy to put on a glam rock musical version of Shakespeare’s The Tempest of which David Bowie would be proud. To engage her students, she uses hits of the time, performed by a fresh young cast led by Davey (Aneurin Barnard). I feel it gives teenagers this wonderful message: don’t be afraid to express yourself! This 2013 British romantic-comedy drama film is about a young man with the special ability to time travel who tries to change his past in order to improve his future. It is absolutely beautiful and this too gives us a message, a message we all need to stay positive each and every day and to live a better life. Life is Beautiful is a 1997 Italian comedy-drama directed by and starring Roberto Benigni. This film tells the story of a Jewish Italian book shop owner, who uses his imagination to shield his son from the horrors of internment in a Nazi concentration camp. It was partially inspired by the book In the End, I Beat Hitler by Rubino Romeo Salmonì and by Benigni’s father, who spent two years in a German labour camp during World War II. This film is probably one of the saddest, funniest and most beautiful films I’ve ever seen, it really does consist of a number of different tears! I have noticed that all of my favourite films are either about A) Love, B) Time Travel or C) Memory Loss, which I find rather interesting!